My trial didn’t proceed on Friday morning (the Crown directed a stay of proceedings) so all in all, it was a solid day’s worth of work. TGIF! I went for lunch with my colleagues in Gastown that day. 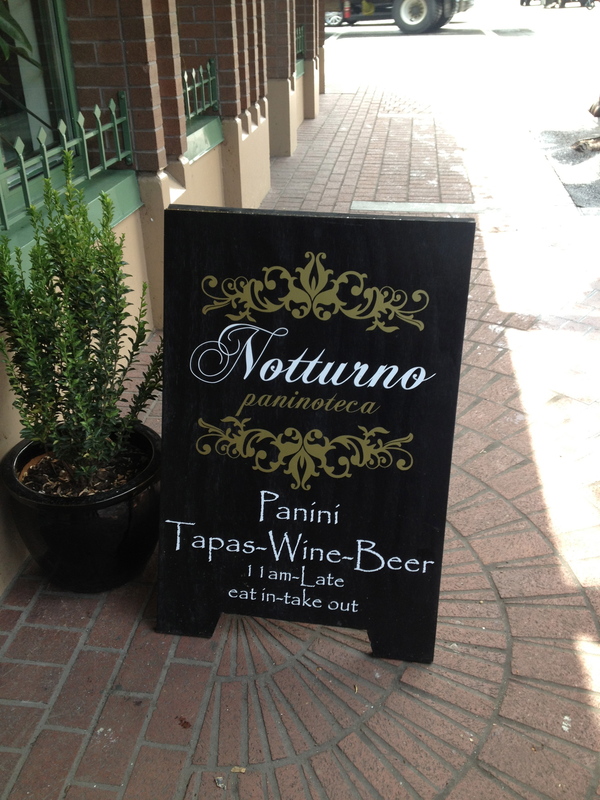 We ate at a charming restaurant called Noturno Paninoteca, located at 280 Carrall Street. 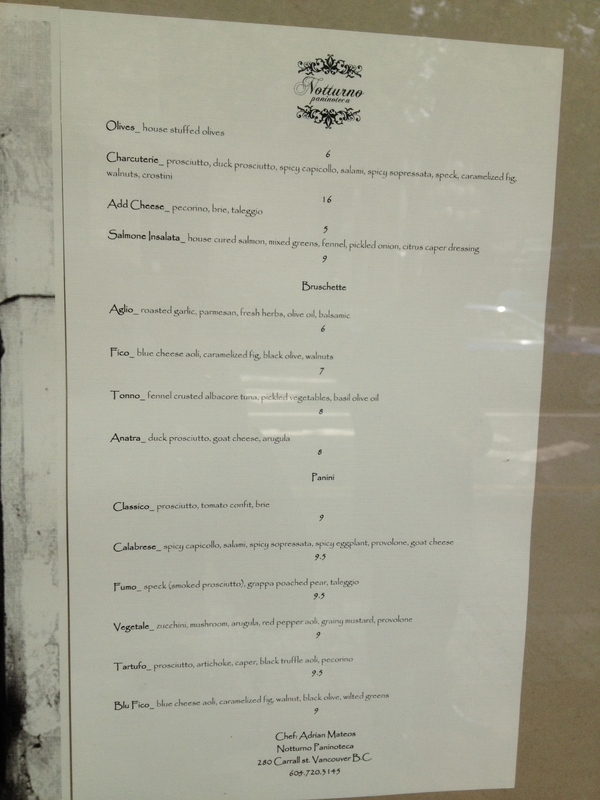 As you can see from their menu, they specialize in paninis. Really really crispy cheesy delicious paninis. It’s totally unassuming from the outside – in fact, even though this was my second time eating there and it’s literally down the street from my office, I almost walked right past it. Even the sandwich board in front of its door didn’t alert me to its presence. The renovated space inside is gorgeous. 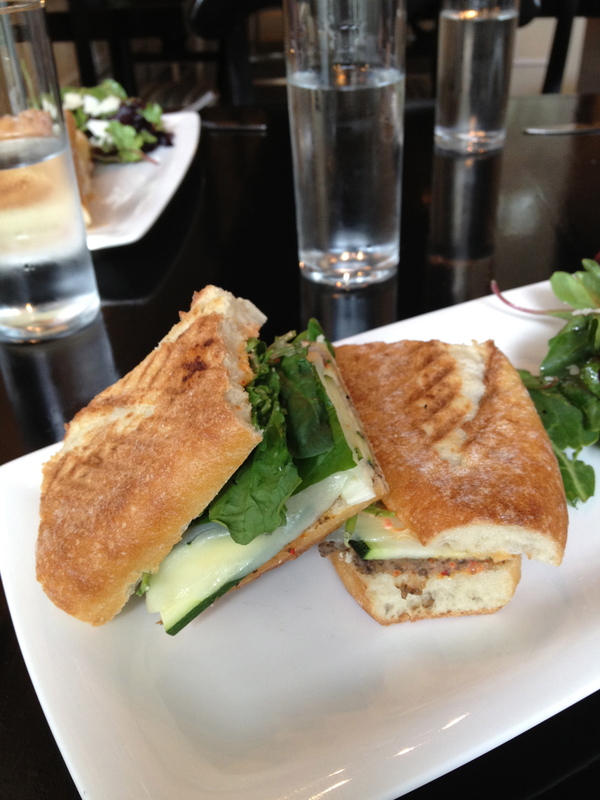 I ordered the Vegetale, a vegetarian panini filled with zucchini, mushrooms, arugula, red pepper aoli, grainy mustard and provolone cheese. So good! The bread was perfect – crisp on the outside and soft on the inside. The vegetables were still al dente (just how I like) and the melty cheese bound it all together. The couple next to our table ordered a charcuterie platter that looked delicious. They were drinking glasses of red wine at one in the afternoon – wish I were too!